Does that paragraph even remotely describe the situation we confront today? The public is in pervasive danger not because the police have been shackled, but because they have been unleashed. We’re dealing with a crisis of impunity, not one of impotence. According to the SYLP, there is nothing wrong with contemporary law enforcement that cannot be remedied by keeping the police above accountability. 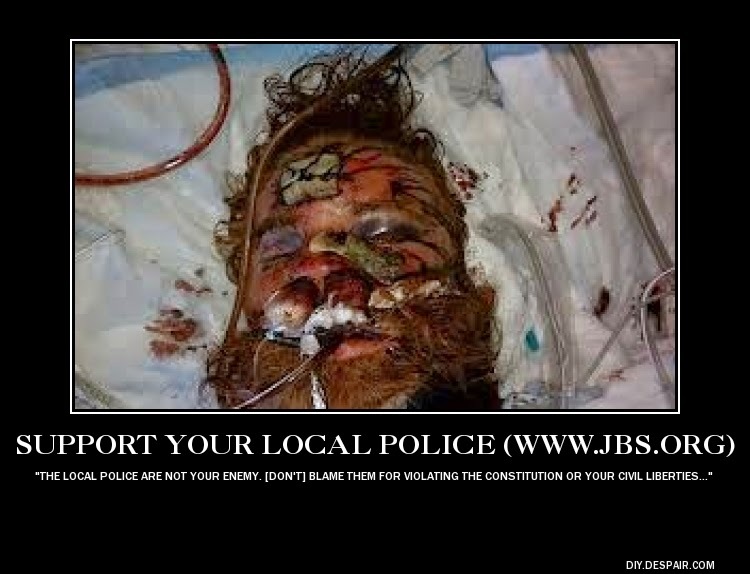 This is the material meaning of the slogan, “Support your local police – and keep them independent!” The group properly emphasizes the dangers of federal subsidy and control of local police agencies, yet its six-point agenda focuses entirely on augmenting the privileges and immunities that have abetted criminal misconduct and protected abusive cops from personal liability. *Accept our responsibilities to our local police … defend them against unjust attacks, make them proud and secure in their vital profession, and to offer them our support in word and deed wherever possible. Every element in this positivist prescription for “responsible citizenship” could be translated and used – without further alteration -- in defense of local police in Cuba, China, Russia, Iran, or any other country whose government was founded on the premise that citizens have “responsibilities” to their rulers, rather than the reverse. This statement is an elaborate and demonstrable falsehood. Police officers have no enforceable legal duty to protect “the law-abiding citizen from the lawbreaker.” Some of them occasionally do provide that service as a matter of individual decency and conscience, but they are not required to do so. A police officer who fails to aid a citizen threatened by criminal violence can invoke the sacred cause of “officer safety” and suffer no repercussions, even if the citizen is severely injured or even killed as a result of that inaction. New York City resident Joe Lozito can testify that this is the case. Lozito was severely wounded by a knife-wielding murderer in a subway car while a gallant member of the NYPD cowered behind a protective partition. After Lozito had subdued the assailant, the officer emerged and took him into custody, thereby qualifying for a commendation and earning plaudits in the press for his “heroism.” When Lozito sought redress from the city, he was told that the police did not have an enforceable duty to protect him, even when he was being hacked to death just feet away from an armed NYPD officer. 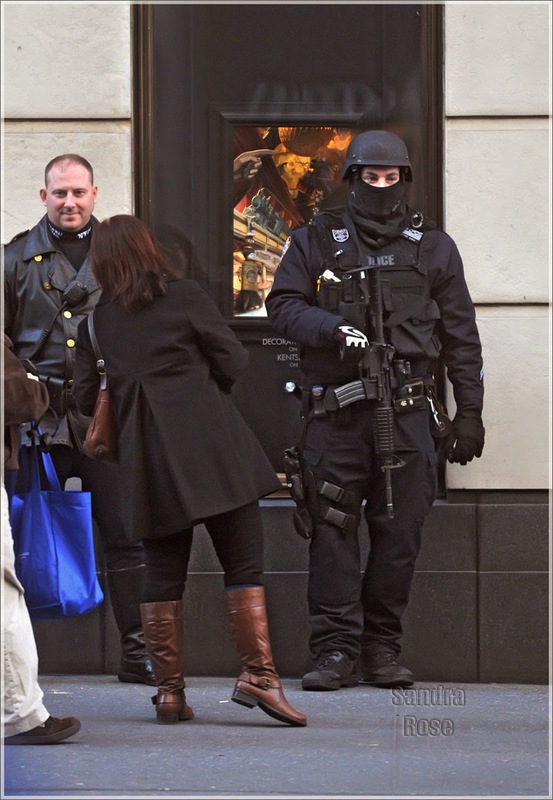 The “thin blue line” of public protection is a pernicious myth. The “Blue Wall of Silence” protecting corrupt and abusive cops is an abundantly demonstrated reality. The Support Your Local Police manual demands that the public buy into the deadly myth, and ignore the even deadlier reality. Nowhere in the SYLP’s “Start-up Manual” is there an acknowledgment of the fact that police are more frequently a threat to the persons and property of citizens than a protection for them – or even that police could be such a threat. The document focuses obsessively on potential threats to what it calls the “independence” of the police – which in substance means the possibility that they would have to answer to the public they supposedly protect, rather than the political class they actually serve. The “local” police are geographically proximate, but they are not locally accountable – and the program presented in the SYLP manual would exacerbate this state of affairs. 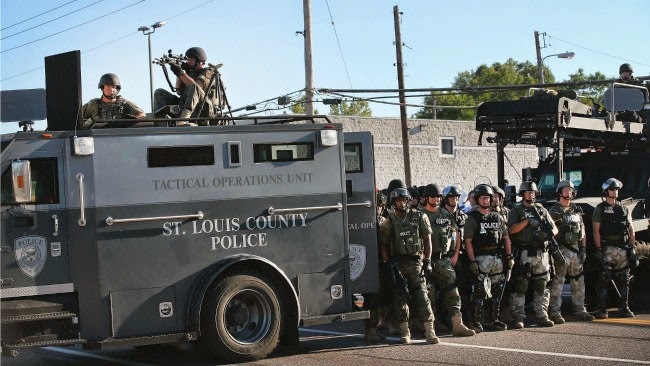 How can the militarization of the police be a “local problem” – but any attempt to reverse that situation be dismissed as a “federal issue”? Exposing and condemning systematic violations of the Constitution and abuses of civil liberties by police do not constitute an “attack” on the police, but an exercise of what most Americans would regard as conscientious citizenship. Where the “local” police have become an unambiguous threat to the population, shouldn’t people do everything they can to prevent them from “receiving … additional Homeland Security funds, new equipment, and weaponry”? In practice, the “support your local police” program will consolidate federal control over police agencies while keeping them “independent” of citizen oversight. While the SYLP manual demands unstinting loyalty toward the police, it preaches unqualified opposition to “civilian review boards,” which are depicted as a part of a decades-old Communist plot to subvert law enforcement. No, I’m not kidding: From the SYLP perspective, anybody who wants to undermine the “independence” – that is, the often murderous impunity – of police is supposedly doing the Kremlin’s bidding, nearly a quarter-century after the Hammer and Sickle was furled and the Soviet Union was tardily consigned to well-deserved oblivion. Civilian oversight of the military is a rudimentary constitutional principle. For some reason, however, the concept of “civilian” oversight of police departments – which are supposedly civilian agencies themselves – is treated as an unpublished footnote to the Communist Manifesto. This idea apparently began with the late Cleon Skousen, who was a Special Agent in Hoover’s FBI before becoming Chief of Police in Salt Lake City. Decades ago, Skousen reported that Dr. Bella Dodd, a defector from the National Committee of the Communist Party, told him that the idea of police review boards “was invented by the Community Party in the 1930s when it was felt that the country was ripe for revolution. 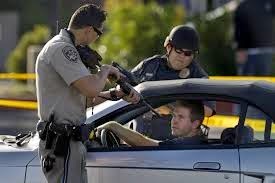 The idea was to somehow get the police out from under the control of elected officials and subject the police to the discipline of a `civilian’ group which the Party could infiltrate and control” – thereby controlling the police. Admittedly, the prospect of local police under Communist control is a horrifying one. In such circumstances, police would be entirely unaccountable to the public. Police cadres would be allowed to kill 12-year-old children without consequences, or burn infants in their cribs in 3:00 a.m. raids, or detain travelers without cause and seize their money and property without due process, or torture hundreds of people into “confessions” without fear of being punished for doing so, or execute harmless mentally ill people in full view of the terrified public…. That is to say that they would behave more or less the way police do today. However, the “problem” with “Communist-controlled” police review boards, according to the SYLP and the police unions whose rhetoric the committee regurgitates, is not that they would make police more violent and aggressive, but that they would supposedly make them weaker and less assertive. Oh, forgive me – that expression of pious reverence toward the State, and willingness to kill and die in its name, actually came from the pen of Chicago Police Captain Michael J. Shaack in his overwrought “expose” Anarchy and Anarchists: A History of the Red Terror. Shaack’s bloated and sensationalistic tome was perhaps the first effort by American police to cast their critics as elements of a monolithic, foreign-controlled campaign of revolutionary subversion. Shaack’s book was published in 1889. His arguments are still being credulously retailed at the end of 2014. Assuming this were true – and it manifestly is not – why would this be a lamentable development? Prior to the early 1970s, “red squads” operated by city police departments collected intelligence that was shared with the FBI, thereby acting as the eyes and ears of what could only be described as a de facto national secret police organization. Hundreds of city police departments also pooled and shared intelligence through the Law Enforcement Intelligence Unit (LEIU), a nation-wide network created in 1956 by then-Los Angeles Police Chief William H. Parker because of a personal quarrel with FBI Director Hoover. Like the Federal Reserve, the LEIU was a public-private partnership: As a “private” company, it was exempt from most forms of public accountability, yet it received federal subsidies to carry out its work. A successor organization using the same acronym exists today, carrying out a nearly identical mission. The problem with this recommendation, of course, is that SYLP and SPLC are carrying out exactly the same mission in the hope of turning the State’s coercive apparatus against their respective political enemies. In this connection it is worth noting that the head of the organization that runs the SYLP campaign has publicly and repeatedly boasted of his background as a police informant in the early 1960s. In terms of numbers, the SYLP campaign is a peer of the miniscule, marginalized left-wing groups it condemns. Its tropes and truisms, however, do resonate on the right, and are recited by the likes of Bill O’Reilly, Sean Hannity, Michael Savage, and herd-poisoners of lesser standing. This form of State-centered collectivism, which I’ve called Punitive Populism, is enjoying a revival at a time when law enforcement is facing a severe crisis of legitimacy. 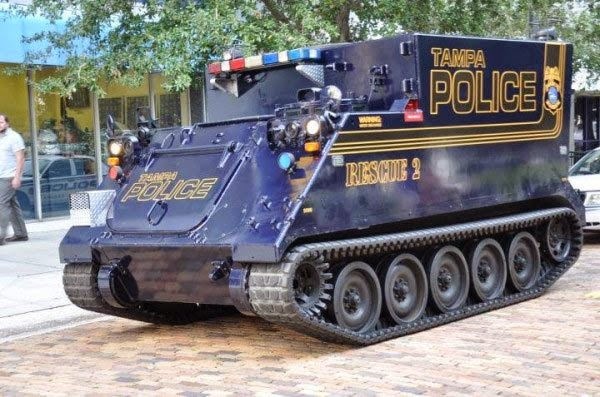 Rather than “educating” police officials about the dangers of the federal largesse that has expanded their toy box and fattened their budgets, SYLP volunteers would be barraging state legislatures with demands that the subsidies and arms transfers end. Instead of pretending that “civilian” oversight of the police is a pernicious Communist plot, the SYLP would agitate for restoration of the grand jury as it existed before it was turned into a tool of the local prosecutor. Prior to the 1940s it was commonplace for citizen grand juries to conduct self-initiated investigations of official abuse and corruption, including outrages committed by police agencies. In place of offering a generic endorsement of “law enforcement,” the SYLP should champion the cause of individuals who have conducted themselves as peace officers, rather than law enforcers – particularly those who have defended citizens from criminal violence from fellow cops. Ramon Perez, who refused an unlawful order to Tase a non-violent elderly suspect, and Regina Tasca, who interposed herself to protect a mentally troubled young man being beaten without cause by another officer, would be worthy subjects of a “Support Your Local Peace Officer” campaign. Both of them were punished, rather than being promoted, for their principled acts. The same was true of Adam Basford, who was shot while taking a violent felon into custody. Out of concern for bystanders, Basford chose the riskier course of a hands-on arrest rather than drawing his gun. Rather than receiving a commendation, Basford was cashiered – and then hit with criminal charges for filing a complaint against a former comrade. More recently a still-unnamed 20-year veteran of the campus police at California State University-Monterey Bay was fired for de-escalating a confrontation with a suicidal student, rather than using his Taser. “It defies logic and is extremely disappointing that, at a time when law enforcement is under fire for using more force than necessary, an officer is being terminated for attempting to use civilized methods to resolve a situation,” observed the student’s perplexed – and grateful – father. But this is typical of contemporary law enforcement priorities. A year ago, PoliceOne.com described how a police chief tried to punish an officer for disarming a gun-wielding suspect during an episode of domestic violence. A police officer is more likely to be punished for refusing to harm or kill a citizen, than for harming of killing one without cause. When individual police officers are being purged or punished for such acts of genuine courage, the Support Your Local Police Committee is conspicuously silent. The SYLP’s criticism of “outside influences” on the police doesn’t extend to the role played by police unions, which are national in scope and allied with other unions that conservatives generally oppose. Local “independence” and individual police accountability would be served by the requirement that civil judgments in cases of police abuse be paid out of police pension funds, more than a few of which have turned “poor but honest cops” into tax-subsidized millionaires. Individual police officers should likewise be required not only to carry body cameras to record interactions with the public, but also individual liability insurance for any injuries they inflict upon the innocent. The most curious element of the SYLP ideology is the casual – and entirely unwarranted – assumption that “security” can or should be provided through a State-operated monopoly. If the objective is to commend and support those who protect property rights, private security operatives – including much-maligned “mall cops” – are worthier of praise than government-licensed purveyors of violence whose mission is to protect the political class that preys on property. We aren’t facing the prospect of a revolutionary transformation of law enforcement into a centrally controlled apparatus of tyranny. We are living with the ripening consequences of a revolution that happened decades ago. What is needed now is a counter-revolution that will break up the State’s “security” monopoly. The SYLP approach is to issue strident warnings about a long-consummated revolution while protecting the system to which it gave birth. You've demonstrated a good example of why I left the JBS. They really aren't interested in liberty or freedom. They're interested in a, for lack of a better way to say it, right-wing tyranny. They're perfectly OK with the police spying on "the left" and they're OK with a "House Un-American Activities" committee prying into the lives of Americans - so long as those Americans are "on the left" or are so-called "communists". But they're not OK with being spied on themselves or having a government that doesn't conform to their vision of how government should be. That's why I finally resigned over a decade ago - the JBS doesn't want freedom or liberty. They want power and control - through a government of their choosing. I continue to appreciate your excellent writing and hope you keep up the good work. Sounds like the John Birch Society is trying to ride yet another wave. enforcement then what do you say is needed? you require the militia? Or the federal government? Elected sheriffs are, in principle, accountable to their constituents. Police chiefs and their subordinates are not. County sheriff's departments, unfortunately, are nearly as federalized as municipal police departments, owing to the "War on Drugs" and the associated federal subsidies. Many, if not most, of the "constitutional" sheriffs who resolved to resist new gun laws are on the Federal take through drug war subsidies and as partners in "civil asset forfeiture." It's worthwhile to make this a campaign issue in county sheriff elections. In any forum (that isn't rabidly pro-liberty) where I post "Abolish Sovereign Immunity", I get vitriolic hate replies about how without an unaccountable elite murdering force people would simply kill each other over table scraps. There are a whole lot of very unstable people who think that the only reason people cooperate is because government police will kill them if they don't. Just repealing Sovereign Immunity frightens such people, and as has been said many times, "Do not frighten a small man, he will kill you." The second amendment is there so that we have the tools necessary to fight the oppressors. 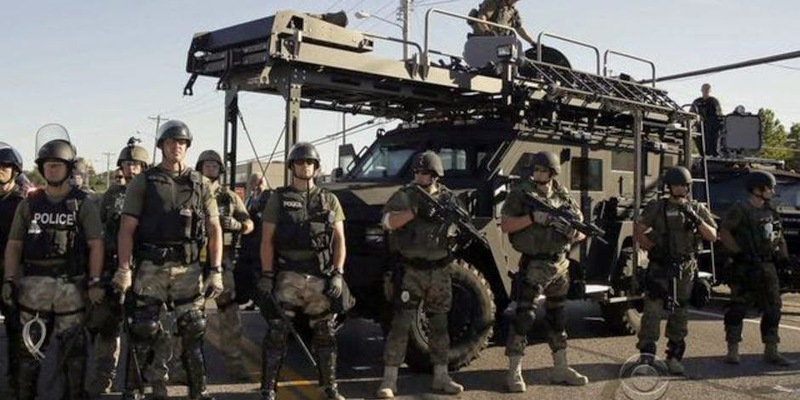 The local police departments all over America have become the oppressors. We need to treat them like our ancestors treated the red coats. I stopped supporting the Support Your Local Police campaign shortly after my suggestion to change their slogan to "Support Your Local Police As Long As They Support The Constitution" was ignored. There is a strong anti-cop brutality segment living in Canada. Witness some of the comments following a poll taken on the topic of Canuck Cops turning "Power Ranger" on the people who pay them. No, I don't support my local hide-behind-the-badge oinkers. The final photo in this piece is quite telling. If you point that rifle at me, you had damned well better use it because I promise I will be using mine on you once I have retrieved it. We need to enforce the third amendment and stop quartering the standing armies known as police departments in our society.